In most situations the President comes off as a pretty cool guy. 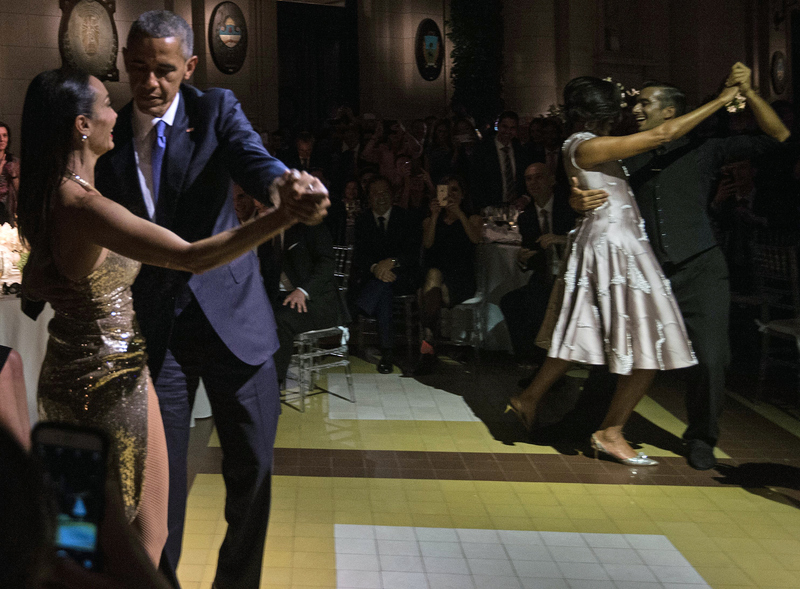 Watching Obama attempt to dance the tango while on an official visit to Argentina Wednesday night, though, you can't help but think back to your own junior high dances full of gangly preteens. It officially takes two to tango — and Obama was the weaker link. While his dance partner in a small, shimmery dress, makes abrupt, quick turns while twisting sensually he tried to keep up. He didn't trip or fall — for a beginner he held his own, but the sensual dance requires more from a dancer. He originally waved off the dancer's invitation a few times before deciding to be a good sport and play along. You have to give him credit for that — many tourists in Buenos Aires wouldn't dare, and anything the President does is uploaded to YouTube within five minutes. Michelle also took to the milonga floor. She like her husband, keeps up with her partner's steps. After the dance, Obama shook Michelle's dance partner's hand. Michelle and the woman who danced with Obama chatted for a minute and exchanged a hug. Obama is in Argentina as a part of a state visit with hopes of strengthening ties between the United States and Argentine economies. Argentina is the third-largest economy in South America, and it just elected a pro-market reformer Mauricio Macri after years of more left-looking leadership under Cristina Fernandez de Kirchner and her late husband, Nestor. On Wednesday, Obama praised Macri for being a "man in a hurry" with regards to the many market-oriented economic reforms that he has carried out since taking office. Macri has lifted capital and trade controls that were put into place by Kirchner's Peronist government in an attempt to keep prices lower for necessities like food. Macri has also canceled energy subsidies. It ultimately led to double-digit inflation which some saw as a reason for her ouster in the elections. The timing of Obama's visit to Argentina is a sensitive one. Thursday marks the 40th anniversary of the right-wing military coup in the country, which the United States supported at the time. Resentment still lingers, especially over the tens of thousands of people who were disappeared or killed by the dictatorial regime during the "Dirty War." In an attempt to appease these critics, Obama announced that the United States will declassify all files concerning the U.S. role in the coup. His tango may win over a few hearts and minds too.